Rabbi Yudin’s warm personality and divrei Torah have inspired tens of thousands of his community members, students, and radio listeners for over three decades. His first book, Rabbi Benjamin Yudin on the Parsha (Mosaica Press, 2013) achieved wide attention and became a bestseller. In this new book, Gateways to Greatness, readers gain privileged access to the inner sanctum of Rabbi Yudin’s life’s work — helping all of us, no matter who we are or where we come from — to change. 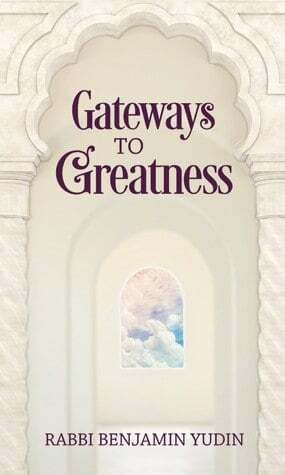 In this fascinating volume, Rabbi Yudin shares with us gateways — ideas, methods, teachings, and practical wisdom — to become happier, better, and more connected people. In this wise and accessible work, readers will come to understand the profound respect and love which Rabbi Yudin’s students and listeners have for him. Rabbi Benjamin Yudin has served as the spiritual leader of Congregation Shomrei Torah since 1969. Together with his wife, Shevi, he has been involved in virtually every aspect of Jewish life in Fair Lawn, and their reputation is known internationally. Rabbi Yudin graduated with a B.A. in History from Yeshiva University. He then pursued a dual graduate program, earning semichah from Y.U.’s Rabbi Isaac Elchanan Theological Seminary, as well as a master’s degree in Jewish History. His association with Y.U. continues to this day, as he teaches Bible and Jewish Thought in the Mechina Program at Yeshiva College, and is a former dean of Mechina’s predecessor, the James Striar School. Rabbi Yudin’s weekly parashah commentary on radio station WFMU’s “JM in the AM” program is heard by thousands of listeners in the Tristate area. Countless others have been inspired by the explanatory essays Rabbi Yudin contributed to the ArtScroll Transliterated Linear Siddur, a landmark prayerbook designed to enable all Jews to be full participants in the synagogue service. Shevi Yudin’s reputation for chessed is widely known. She is part Rebbetzin/part sister to the women in the community. Her home is always filled with guests and she has been known to make pre-Shabbos house calls, along with her husband, to drop off kugels at members’ homes. The Yudins have seven children who live in New Jersey, New York, and Israel.